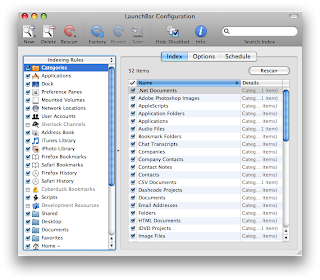 The Noun / Verb model of Quicksilver is also well represented in LaunchBar. I have a file sitting on my Desktop that I would like to send to my colleague Dan. I activate LaunchBar and type the first couple of letters of the file I want to send him. I then select it and hit Tab. Next I type "Dan" and my buddy’s address book entry comes up. I hit enter and I have a new message with the file attached and addressed to Dan.